Macedonia, a landlocked country, officially the Republic of Macedonia a country in the Balkan peninsula in Southeast Europe is in news. It is one of the successor states of the former Yugoslavia, from which it declared independence in 1991. It became a member of the United Nations in 1993, however there has been a running feud with Greece over the use of the name "Macedonia", and hence admitted with provisional description the former Yugoslav Republic of Macedonia, (sometimes abbreviated as FYROM and FYR Macedonia). Alexander the Great inspires and is the subject matter of history ~ the great Emperor ( 356 BC – 323 BC), ruled from the ancient Greek kingdom of Macedon[a]. He was a member of the Argead dynasty, succeeded his father Philip II to the throne at the age of twenty. He spent most of his ruling years on an unprecedented military campaign through Asia and northeast Africa, as he created one of the largest empires of the ancient world by the age of thirty, stretching from Greece to northwestern India. He was undefeated in battle. Macedonia was an ancient kingdom, the dominant state of Hellenistic Greece, founded and initially ruled by the royal Argead dynasty. Sparta was occupied later by Antigonus III Doson. Philip II's son Alexander the Great, leading a federation of Greek states, accomplished his father's objective of commanding the whole of Greece when he destroyed Thebes after the city revolted. After Alexander's death in 323 BC, the ensuing wars of the Diadochi, and the partitioning of Alexander's short-lived empire, Macedonia remained a Greek cultural and political center in the Mediterranean region. Back home, in 1971, Trichinapoly was officially changed as Tiruchirapalli ~ many a cities have changed their names adopting back their old names. Madras became Chennai, Baroda to Vadodara; Bombay to Mumbai; Trivandrum to Thiruvananthapuram; Cochin to Kochi; Calcutta to Kolkata; Pondicherry to Puducherry; Bangalore became Bengaluru ~ the list has no full-stop – there could be more in the offing – but the subject matter of post ‘though opposition to change in name is far different!”. Macedonia is a region of Greece in the southern Balkans and the second largest and most populous in the country. The mountainous region incorporates parts of ancient Macedon, a kingdom ruled by Alexander the Great ; the Republic of Macedonia is an entirely separate entity - a country in the Balkan peninsula in south east Europe. In Europe, there has been news of Greek protesters gathering outside parliament in Athens on Sunday, calling on the country of Macedonia to change its name in the latest chapter of a 25-year row. Greeks object to Macedonia's name because they have their own territory called Macedonia. They argue that the use of the name by their neighbour implies territorial claims over Greek land. Greece have blocked Macedonia's aspirations to join NATO and the European Union. Efforts by the two countries to settle the dispute have been inconclusive since the Balkan state broke away from Yugoslavia in 1991. MailOnline reports that thousands of protesters gathered outside Parliament in Greece as the long-running row over the name of the Former Yugoslav Republic of Macedonia continued. Protesters took part in the massive rally as politicians from both sides try to revive attempts to come to a amicable solution between them. The protesters called on the government to ensure that any solution banned the use of the term Macedonia in the country's new name. Organisers expect a big turnout for Sunday's rally which follows on from a strong protest in the Greek region of Macedonia in January. 'Macedonia means Greece' read a big banner on Syntagma square, which has been the main scene of protests against austerity since the debt crisis began in 2010. 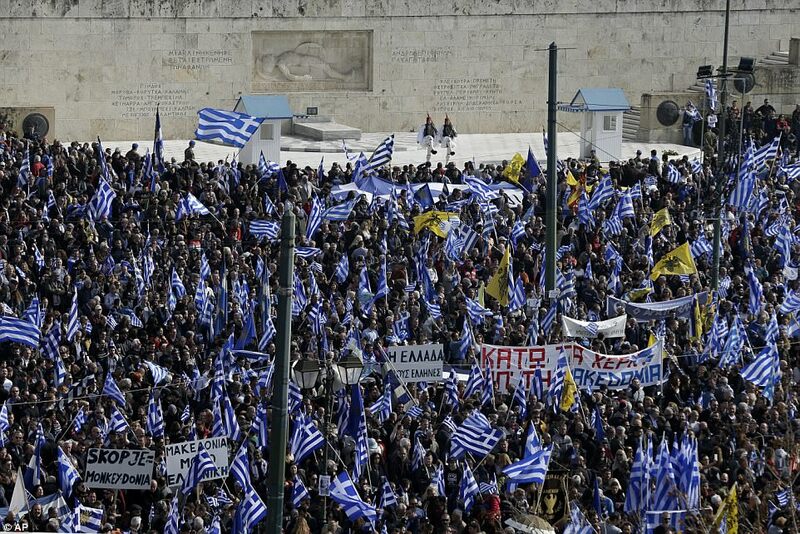 People with Greek flags also attended a rally in front of the Tomb of the Unknown Soldier in Athens. Among key speakers was world-renowned Greek composer Mikis Theodorakis. Hours before the rally, unknown assailants threw red paint outside the home of the 93-year old leftist artist, a symbol of resistance against the 1967-1974 military junta, and sprayed slogans on the walls against his involvement. About 300,000 people turned out at a demonstration on January 21 in Thessaloniki, capital of Greece's Macedonia region. The case arouses strong emotions among Greeks who consider Macedonia, the ancient kingdom ruled by Alexander the Great, to be an integral part of their homeland and heritage. The left-led government has proposed a compound name, with a geographical qualifier, which would be the only name that could be used for the country. A poll published in the conservative Kathimerini newspaper showed that about 70 percent of Greeks oppose the use of 'Macedonia' in any solution. Gathered around the statue of Alexander the Great in Thessaloniki were members of the neo-Nazi Golden Dawn party and local clergy. Cretans in traditional costumes who travelled from the southern island with their horses, as well as people from northern Greece wearing costumes from the Macedonian wars era a century ago, crowded at the White Tower on the Thessaloniki waterfront from early in the morning. Greece and Macedonia had earlier returned to the United Nations hoping to reach a compromise that could end dispute over the former Yugoslav republic's name. Outsiders may ask what is in a name ? ~ only those affected and those who own, know the pain and power.